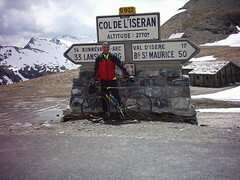 Through most of the 20th century, the Col de l’Iseran was known as the highest road in Europe. While no longer quite the highest, it literally goes over the French Alps near (and well above) the ski resort at Val d’Isère. It had been a dream of mine to climb this Col since a ski vacation to Val D’Isère. Despite being mid June the Col was still officially closed due to snow but the roads were clear (with large drifts at the sides). Starting in the little town of Langslebourg (about 33 kms from the top), the ride starts with a steep climb of the Col du Madelaine (not the famous Madeleine). This is followed by a long flattish spell of over 15km – when suddenly the road turns up into the mountains. It is a beautiful, peaceful ride – with absolutely stunning views. Waterfalls and mountain streams are everywhere due to the melting snow. I must have seen 20 marmottes (big beaver-like rodents), usually too shy of people but there are few around. The view of the curving steep road is awe inspiring. The steep climb is about 13 kms and is especially hard near the end. I felt fit and great up the whole ride but tired legs and thin oxygen made the last 1000 meters a struggle as i went past the ski lifts in a high section of Val d’Isere. At the (very windy) top, I found an Austrian couple who agreed to take my picture – after I asked them to move their motorcycle. I then descended about half way and meet Doreen. FANTASTIC ride. In July I hope to climb the col from the other side.